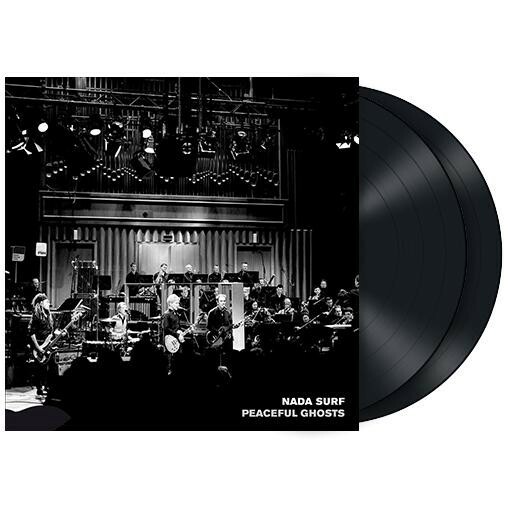 You probably haven’t heard but Nada Surf, the low-key indie pop stalwarts who will unfairly exist in the shadow of their ‘90s buzz bin single ‘Popular’ until the end of time, have been quietly funneling new releases into our ears at a workmanlike pace over the last year. After pushing out the heavy (and expensive) 3 LP album Live at the Neptune directly to fans via PledgeMusic in late 2015, the Canadian band calmly returned to their day job as the senior anchor of Barsuk Records’ post-Death Cab lineup and churned out yet another underrated studio record of fuzzy pop songs in March of 2016 (You Know Who You Are). And now, as this building pattern suggests, the trio-turned-quartet are back with their second live album and third overall release in 14 months, Peaceful Ghosts. The double LP set, housed in a textured gatefold sleeve with ambiguous, non-specific ‘limited vinyl’ hype sticker, documents the quartet’s 2015 concert with Germany’s Babelsberg Film Orchestra for Austrian radio. The show’s set list features familiar favorites from across nearly all of the group’s studio albums; unfortunately, their noisy debut which spawned their one previously mentioned 1996 hit single is not represented here. 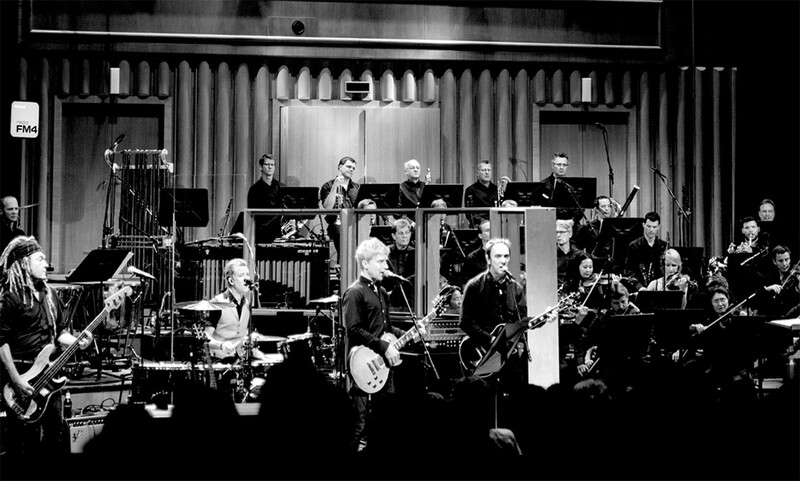 Peaceful Ghosts is not as comprehensive of a career retrospective as last year’s Live at the Neptune, however, the novelty of the orchestral arrangements and the large, classy black and white photography give ‘Peaceful Ghosts’ an edge in the ‘capturing a specific time and place’ department. The album also contains a few slices of stage banter- the most interesting aside very casually reveals the origin of how Nada Surf transitioned from messy garage rock band into deliberate indie pop dads. One late night while on tour, as singer and guitarist Matthew Caws tells it, he was struck with late night inspiration to write a song but, due to sharing a hotel room with sleeping band members, found himself forced to strum his guitar quietly in a hotel bathroom like a lunatic. The result was their “first quiet song” which, as any fan of the band can probably guess within two tries, became ‘Blizzard of ’77’, the opening track on their career-redefining 2002 album Let Go. Although the orchestra angle can read like a familiar gimmick (artists David Bazan, Death Cab for Cutie, and John Vanderslice have all experimented with orchestra-backed records recently with a varying level of success), the new layers are applied gently and the source material is simple and solid enough that Peaceful Ghosts maintains a defamiliarizing charm but never comes off as forced grandiosity nor a retread of the original studio songs or the recent live record. The song choices range from dependably safe (‘Inside of Love’, ‘Blonde on Blonde’) to pleasantly strange (‘The Fox’, a darker track buried deep at the end of 2008’s Lucky) and aren’t afraid to include newer songs (‘Out of the Dark’, ‘Animal’, ‘Rushing’, and ‘Believe You’re Mine’ are all off their newest LP). Note that, despite the album’s effectiveness as a standalone release and the band’s 20 additional years of quality output, we are still going to bookend this article with one last reference to their geek-rock alt-radio hit ‘Popular’. Remember at the end of the music video when all the football players were suggestively smiling at each other in the locker room showers? That was pretty edgy for 1996.